Among the holy grail of Ohtani rookie cards. Since making his MLB debut, Ohtani has quickly become one of the most recognized international brands in all of baseball and is arguably the best pitcher/hitter threat since Babe Ruth. A great indication for any serious investor. 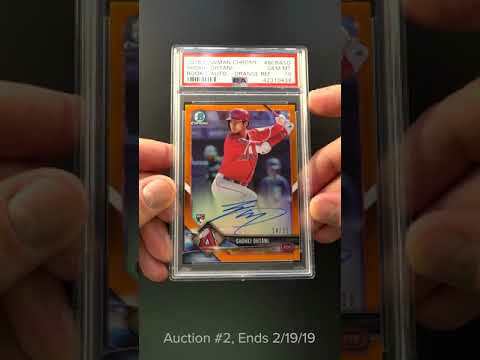 The offered PSA 10 Orange refractor Ohtani is widely considered to be his most important and beautiful rookie productions which is seldom seen in high-grade. The offered masterpiece represents the sole copy to reach the elite PSA 10 assessment. The card possesses perfect centering with crisp edges and strong card stock. Shows blemish free borders with dagger corners and fabulous registration. The surfaces are immaculate with zero scuffs, scratches or refractor lines present. On top of all of these amazing card qualities, the autograph shows many signs of being pristine and is beautifully penned in blue ink. Tough high-grade modern rarity's, such as this card, are soaring in value as investors target these elite offerings. We are proud to offer this world class commodity to the eBay community free of reserve. Don't miss it. One of over 15,000 cards, lots, and sets up for bid in our 2nd Auction of 2019. Click on the link above to view the other PWCC auction lots. The PWCC Vault is now live! Open a PWCC Vault account and receive a custom Vault shipping address. Purchases shipped to the Vault receive free shipping and reflect Oregon's 0% sales tax rate.